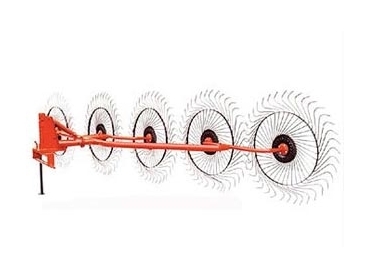 FarmTech Machinery offers a range of rakes and tedders, including high quality finger rakes, rotary rakes, swather/conditioners, tedders, and V rakes. AFR50 5 wheel rakes are included in this range. Weighing 195 Kg, these wheel rakes feature 160 fingers and have a minimum Hp requirement of 30 hp - 50 hp. Their dimensions are 2100mm (width) x 5000mm (length) and they have a working width of 2200mm 2600mm. Farm Tech Machinery Pty Ltd is an Australian, family owned and managed company. They also export their range of machinery overseas, and imports agricultural machinery from other leading manufacturers in the world to meet the needs of the Australian farmers.